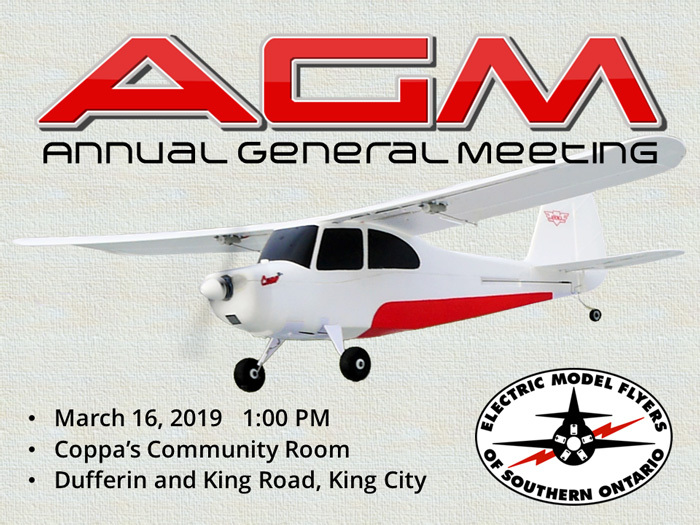 All members of Electric Model Flyers of Southern Ontario are invited to attend the Annual General Meeting. The AGM is an important opportunity to discuss club business and to make plans for 2019. This year three positions for Director are open. Nominations for Director are open to members of EMFSO in good standing who are 18 years of age and older. I wish to thank you for your support and turnout at the AGM this past weekend. On behalf of the Board, I would like to thank Justin for his time with the EMFSO Board and hope he can get more time to come out and enjoy the hobby. I also would like to welcome Brad to the Board and wish him success with his new position as Outdoor Director. We are working on setting some dates and activities this coming weekend so if you want to provide the Board with some suggestions for activities, now is a great time to do it. The Trisan program is also in the midst of being renewed and we hope to see you there once the dates have been officially set. We are going finish the meeting as soon as we can on Sunday and then gather at the field for some impromptu flying. Take care and see you very soon.